The data that Gordon is talking about mostly comes from gliders that collect environmental data as they make continuous zig-zags between Pioneer Array moorings. 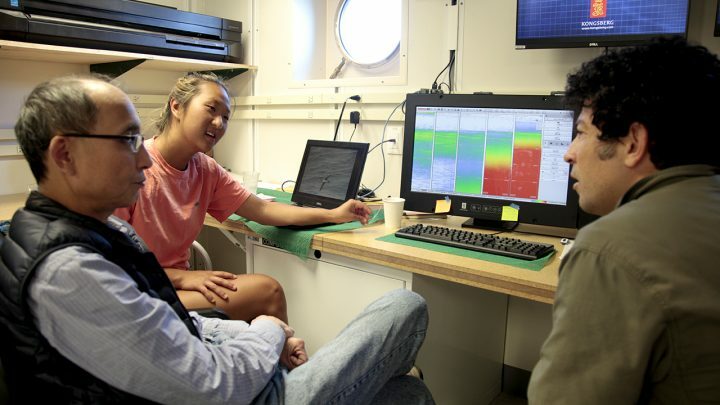 They’re out here in all kinds of weather, taking measurements of current velocity, salinity and temperature, and sending that information back to people like Gordon in his lab at WHOI. But as great as the moorings and gliders are, they can’t react to every situation in real time. 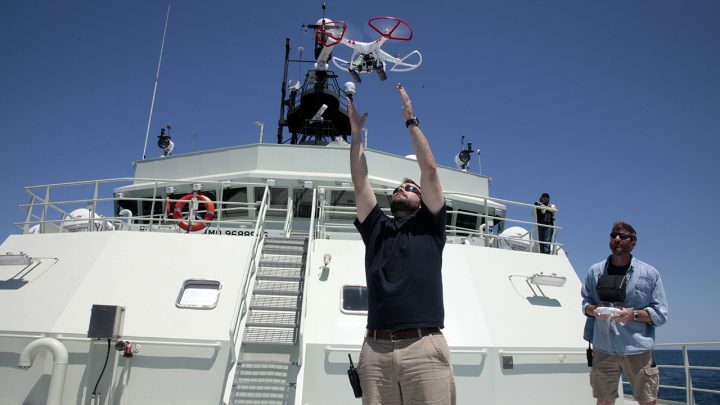 That’s why research cruises are crucial: scientists can travel to particular locations and, based on what looks interesting from glider or satellite data, get more detailed information at that point in time. 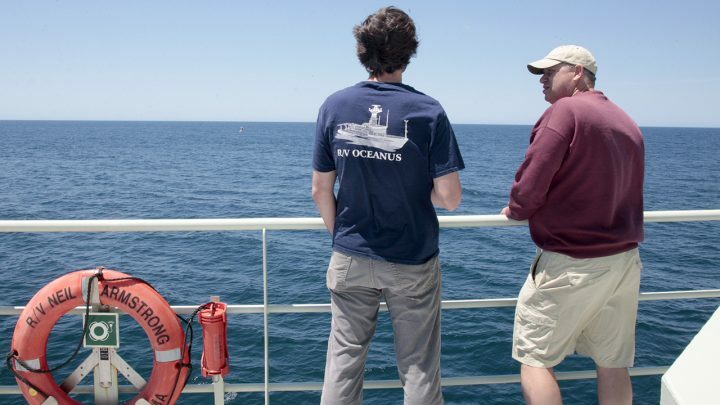 This science verification cruise was planned in the Pioneer Array, in part, to groundtruth the observatory data with biological and chemical samples. 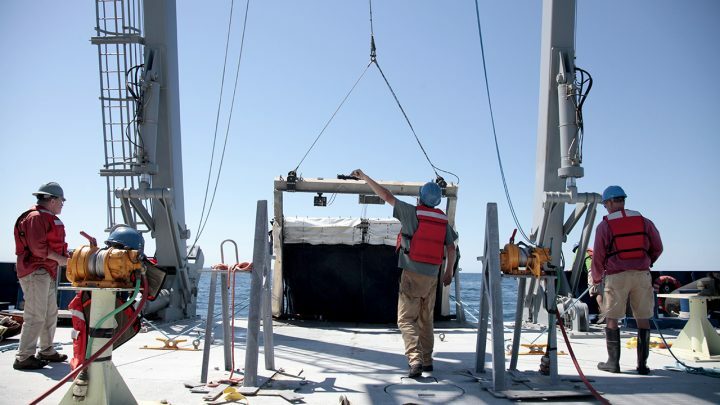 So far, scientists are finding strong correlations between what the Pioneer sonar is picking up, what the shipboard acoustics are tracing, and what’s being pulled up in the nets. So it didn’t surprise Gareth to find large numbers of pteropods in the MOCNESS: with help from colleagues, he had already identified huge patches of them in the acoustic scattergram. To an outside observer such as myself, I find it incredible that it’s possible to discern a pteropod from a copepod (or from a whale, for that matter) on the colorful screen grabs. But because they’ve already determined the pteropod’s acoustic scatter signature (they sport a hard calcium carbonate shell that is denser than that of a copepod) the scientists were able to make an educated guess of what they’d pull up in the nets at specific depths. The 10-meter MOCNESS (MOC-10) has been experiencing technical difficulties. It ripped in several places during a test deployment on Friday and had to be sewn back together by Christina, Joel, and Carin. It went out on a 600-meter deployment yesterday and came back missing an entire section of net—the section closest to the surface. Biologist Peter Wiebe, who invented the technology back in the 1970s, attributed these mishaps to the fact that the net is old and it was being dragged at a considerable clip at high pressure. 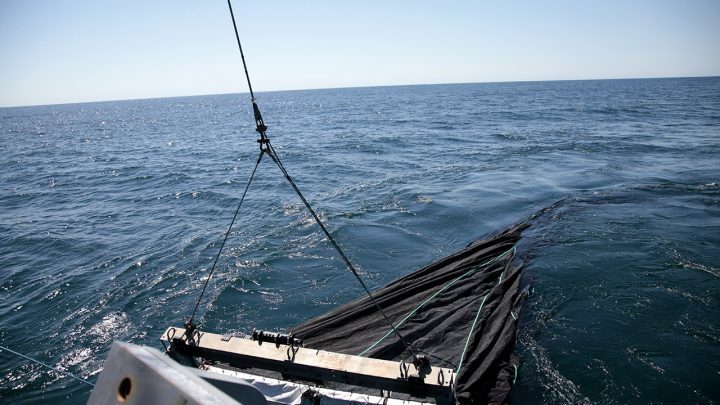 Since this is the first time this net had been used on the Neil Armstrong, it’s a valuable lesson for future research cruises : go slow as you tow! Despite the frustration of losing valuable net samples (including a “cod end” or sampling bucket from an intact section of net), spirits are high. The rest of the nets revealed lots of interesting mesopelagic life—the kinds of things you’re more likely to see in horror movies than in the fish market. Biologist Joel Llopiz was excited to find a snipe eel, a small, clear eel with a huge jaw in the first MOC-10 tow. He’s adding it to the collection of wonders he found on Saturday, including three lantern fish, which use bioluminescence on their bellies to blend in with sunlight from above. During another MOC-10 tow on Sunday night, he and Christina picked up an aptly named hatchetfish and some as-yet unidentified eel larvae. By casting the MOC-10 after sunset, the biologists will be able to compare the diurnal differences, or the contrast between daytime and nighttime activity. Watching the EK-80 monitors from the computer lab, they could already predict it: large patches of zooplankton congregating at the surface, with fish close behind—and most likely marine mammals to follow.